Join Star-Lord on his mission to protect the galaxy in the latest Marvel HeroClix: Guardians of the Galaxy Organized Play Event! With Gamora and Drax the Destroyer by his side, the Guardians are ready to take down any opponent on the tabletop. In the Marvel HeroClix: Guardians of the Galaxy Organized Play, players will face off at their local game store for the chance to win exclusive prizes. This organized play kit includes Star-Lord featuring an all new sculpt, Gamora with new coloring and dial, and Drax the Destroyer featuring new coloring and dial. The figures include their cards. Check with your local shop to see if they’re participating! I’m really looking forward to getting my hands on each starting team for the upcoming Knight Models game Marvel Universe Miniature Game. With the Avengers, X-Men, and Guardians of the Galaxy to choose from, it’ll be hard to decide which is the one to start with (so might as well start with them all). We now know who will be in the Guardians of the Galaxy starter set. Each set comes with four miniatures as well as a mini-rulebook. The Guardians will include Star-Lord, Gamora, Drax, and Rocket Raccoon. I’d assume Groot will be the miniature released in a blister along with the team. From their description, the team looks to have a decent mix and shooting and close combat. Star-Lord fitting the quick (via his rocket boots) figure to get in position to fire off his Quad Laser and Element Gun. Rocket is all about his guns, as he should be. Gamora has a gun and her Vorpal Blade, mixed with stealth she too will be maneuvering around the board for the attack. Finally Drax is a tank and all about close combat, not just using his knives, but also acting as a bodyguard and soaking up damage for others. All of the team are the affiliation Cosmic/Hero. With that equipment and abilities it’s easy to see how you’d play this team in the game, maneuvering with some as you shot, shooting at a distance with Rocket, and getting Drax in close for the kill. 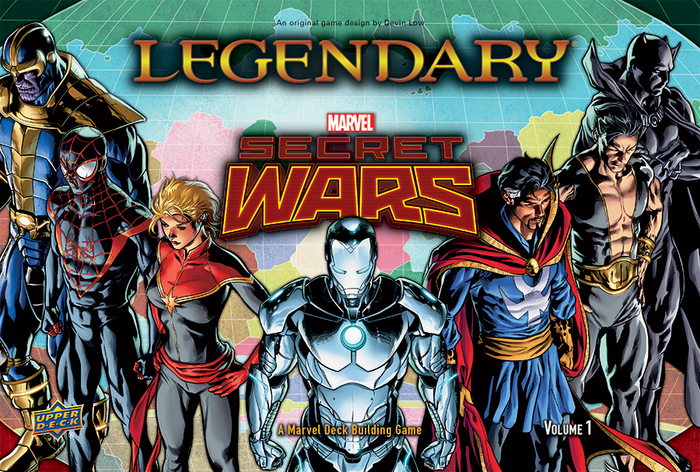 Legendary Secret Wars Vol. 1 is the fifth expansion of the Marvel Legendary base game, but also only the second big box expansion. Thus far Marvel Legendary has been extremely streamlined, as every expansion has mostly built on the group of characters in the game while also expanding slowly but strategically on the base rules. Inevitably though, anything which is Marvel is going to be compared to DC, and so the comparison to the DC Comics Deck Building Game is going to be discussed as well, and for the first time it would seem as though Upper Deck is taking on Cryptozoic with this new release. What DC Comics Deck Building lacks in a concise gameplay experience, it makes up for in variety. It already features a head-to-head option, as well as a wider variety of characters to play with, both as the main character and as cards to be acquired. Due to the framework of the game, Legendary has always been a bit behind in this regard. Not counting the Villains expansion, this represents the 60th playable character in the series, and even at that, three of those have now been a version of Wolverine. There are some new rules for this game, some which work and some which don’t. Potentially the most interesting was the Sidekicks group of cards, which could have been thematically different, just with the specialists in Legendary Encounters: Aliens, but they come off as identical versions of themselves. More interesting is the ability to “purchase” Ultimate heroes by defeating them in combat. Among others this includes the first time that Wasp is a playable character in the franchise, though evidently not directly as we might have hoped. There are a couple of other interesting rules changes, including multiclass cards and the ability to bribe your enemies instead of attacking them directly, but the biggest change overall is that of the head-to-head option. This is aided in part by the Ambition deck of cards, but evidently this does not work thematically as much as it should. In this case one player can play as a mastermind and recruit heroes (by corrupting them). This comes off as a bit disingenuous for the series which has tried at all times to keep the game experience as close as possible to the comics experience (as opposed to DC) and seems to be there only so players can have a true player-vs-player experience. While this version of the game does come off as a bit weird, it ends up working pretty well when following the suggested rules for integrating both the Heroes and the Villains game. This is also noteworthy as the cards are not only compatible with both games, but also help to incorporate them together. The new cards are mostly impressive additions to the mix, though it is evident that Upper Deck is still holding back some of the bigger characters so that there will be interest in future expansions. The biggest names that fans are going to be interested in are Kitty Pryde, Captain Marvel and Black Panther, although there are probably others happy to see Thanos, Doctor Strange, Black Bolt, Lady Thor and Namor. The remainder of the playable heroes is a bit of a mixed bag, featuring another Wolverine, another Spider-Man, another Iron Man, and a few others to tie into the Secret Wars story line from Marvel. Other noteworthy cards are new groups of henchmen, which have been notably absent since the first expansion, and a new bystander card, the banker, with an interesting mechanic. This expansion also represents a move away from what fans might have though was going to be a closer tie-in to the movies, as last year’s Guardians of the Galaxy coincided closely enough with the movie. For those that were hoping to see Ant-Man and Wasp show up any time, they will be disappointed. At the very least though, Upper Deck seems to have a long terms plan for this series, and while there might be a bit of disappointment among fans for the releases here, it would seem likely that they plan something to coincide with next year’s Captain America movie, which could include Ant-Man, Wasp, Scarlet Witch, Vision and Falcon among others. As well at some point a Secret Wars vol. 2 of the game is presumably coming, which could also help to fill in some gaps. In the meantime, fans will have to be happy with this expansion, which contains a bit of what they wanted, but also a bit more which they did not. It is not a disappointment, as the cards themselves are well conceived for the game experience, but they appeal more to the true gamers, not those who are are also comic fans. It thus ends up being a solid expansion gamewise, but leaving a bit more to be desired thematically. 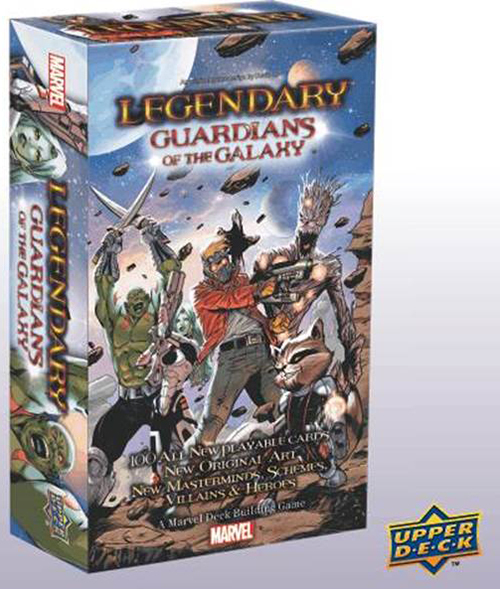 The Guardians of the Galaxy for the Legendary Deck Building Game is the sixth release in this series, and the fourth expansion for the core game. This is the first expansion released in what is presumably trying to tie into the Marvel Cinematic Universe, this expansion adds in new mechanics to the game while adding the core characters from the Guardians of the Galaxy – Star-Lord, Gamora, Groot, Drax and Rocket Racoon. Along with the new characters come new kinds of cards, infinity gems and artifacts. The game does play out pretty well, particularly focusing on what is to date the most powerful of the line’s villains in Thanos. The new scenarios also add to the overall challenge of the game, which has a tendency to be a little easy for most of the typical scenarios in a lot of the cases. In this sense this expansion is the best since the release of the Fantastic Four expansion which had introduced some harder scenarios and more challenging villains. Having only played this version as a standalone with the base rules, a player that was after a more challenging game could throw in the Heralds of Galactus into the villain deck for a near impossible challenge. There are a few drawbacks to this game. Perhaps the most obvious is the natural evolution of deck building games. Most eventually come to resemble one another, and in so doing this expansion takes on aspects of other popular deck building games such as Dominion and the DC Deck Building Game. As well, this expansion had been rumored to include a sixth character, which is absent, but it feels as though the developers could have thrown another in there – Carol Danvers’ Captain Marvel or Nova – just to expand the game a little as well. Another problem is that with the introduction of artifacts, that fans are going to wonder why this was not include earlier as artifacts are essentially just equipment, and fans of the comics are likely to want to see a lot of artefact tie-ins in the future, be them web-shooters, Captain America’s shield or even Wolverine’s claws. On the whole though, this is a good expansion and keeps the core of the game relevant while adding a bit of new mechanics to make the game just a little different. That this was released to closely tie into the movie is also hopefully not a coincidence, and is rather an attempt by Upper Deck to tie into all Marvel movies a lot more closely which means that we will see a steady progression in this series to include most of the Marvel Universe. Wizkids' New Trailer for Marvel HeroClix: Guardians of the Galaxy! 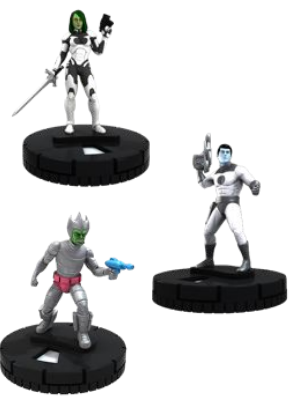 If you’re unfamiliar with Wizkids‘ game Heroclix, or just want to check out their latest set release for the upcoming Guardians of the Galaxy movie, the company has released a video showing off some of the sculpts of the figures.